The guest speaker for our April 8th meeting will be Eric Mueller. The meeting will be hosted in Room 101, Casa del Prado in Balboa Park at 6:30 pm. We will take Eric to dinner before the meeting around 5:00pm at the Blue Water Seafood Grill at 3667 India St.
Eric will be discussing basics of mushroom cultivation and different methods for growing mushrooms. He will also be discussing medicinal mushrooms and their health benefits. Please bring mushrooms you find so we can get them identified 6:30-7 pm and help promote our citizen science project “San Diego Mycoflora Project” at the same time. Print out data slips here and fill them in before leaving any specimens! Like taking pictures of flowers? Enjoy hiking or surfing? Like to read or play computer games? You can help science while enjoying these activities! Citizen Science is when members of the public contribute to real scientific efforts. San Diego is a scientific hub with many open, ongoing research efforts in need of people to contribute as volunteer researchers. You DON’T need a science background to help answer important research questions. Learn about the many citizen science projects happening here in San Diego and how you (and your kids) can contribute to real research. Museum scientists go on expeditions to remote areas of the Baja California Peninsula to study and better understand the biological diversity of areas that are not well documented. One such expedition took place in November 2017 in one of Baja California Sur’s most spectacular cardón forests. Sam Andrasko is the head grower and managing partner of Creekside mushroom Farms located in the Samataguma Valley in Guatay, CA. He has been growing mushrooms for the past 23 years and is a past President of The San Diego Mycological Society. Sam has invited us to the farm on Saturday March 30th from 10am to 3-4pm’ish to tour his farm and learn about cultivating mushrooms. We will have the opportunity to make fruitable shiitake and oyster logs and learn hands on how to make our own King stropharia beds that will fruit in the late Spring and Fall here in Southern California. Sam will do his best to provide us instruction on how to manage the cultivation of mushrooms in our arid environment with tips and tricks he has learned through his years of cultivating mushrooms. The farm is located about 30 minutes east of San Diego so bring a dish to share for a lunch potluck. From San Diego: Take I-8 east to to CA-79N/Japatul Valley Rd. exit 40 and turn left after exiting. 5 miles up the road will be Heavenly Oaks residential trailer park on the right. Our entrance to the ranch is on the left. The driveway is called Farley flat road. Enter through the gate and drive 1 mile up the drive to our location. We will direct you where to park once you arrive. The guest speaker for our February 4th meeting will be Mary Ann Hawke. The meeting will be hosted in Room 101, Casa Del Prado in Balboa Park at 6:30 PM. We will take Mary Ann to dinner before the meeting around 5:00 at the Blue Water Seafood Grill at 3667 India St. Volunteers from the San Diego Mycological Society have been archiving mushrooms gathered during their forays at the San Diego Natural History Museum (the Nat) with the goal of cataloging the diversity of mushroom species of San Diego County. Documenting our local flora and fauna is crucial because our region is a global hotspot of biodiversity, yet habitats and species are threatened by wildfire, urbanization, invasive species, and climate change. Come learn how YOU can become a citizen scientist and use the iNaturalist app to participate! You’ll also hear about the DNA Barcoding initiative we’re undertaking, as part of the North American Mycoflora Project. Please bring in mushrooms you find so we can get them identified 630-7. Mary Ann Hawke Ph.D. is a SDMS member, ecologist, and educator who has been spearheading this project in conjunction with the San Diego Barcode of Life and the San Diego Citizen Science Network. Mary Ann was the Director of the San Diego County Plant Atlas and trained 500 citizen scientists to document our local flora. Every year, we provide opportunities to more than 70,000 members of our community to experience The Nat through programs designed to offer low- to no-cost Museum access to all. We need to collect fresh specimens for the fair! Join us on a Foray this Saturday Feb 16 with the San Diego Mycological Society. 24251 Highway 76, Santa Ysabel. Sign says Lighthouse Farm. If you get to the lake or San Luis Rey campground you have gone too far. Bring your own basket and collecting tools. Pot-luck style, no access to inside house (so no facilities!). If you can’t go on the foray, or prefer to collect somewhere else and bring specimen for the day. (Anyone welcome, i.e., you don’t need to be a member to bring specimens to the fair). Here are some collecting tips. Store with some of the substrate with which it was found. Can store in fridge inside paper bag, waxy paper bag, or even to go containers. Bring either Saturday night during set-up or Sunday (hopefully before fair begins) and we can use the specimen for our Identification table. Collect specimen with ID, where it was found, substrate, smell, and other identification details. Bag for Duff with each collection. Keep up with mushroomy news, events and stay connected with us on all of our social channels. You can find us on our newly revamped Facebook Page and on Twitter, Instagram and Meet-Up. Whales are magnificent creatures, full of mystery and wonder… and one mystery that has puzzled scientists, including our very own Curator of Paleontology Dr. Tom Demèrè, for decades is how and when the evolution from teeth to baleen occurred in of the ancestors of today’s filter-feeding whales (e.g., blue, fin, humpback, right, and gray whales). 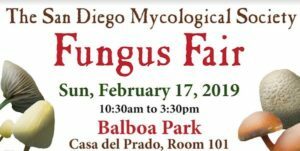 Fungus Fair is this: Sunday February 17, 2019 10:30-3:30. As a club we need your help to make this event great! Consider being a volunteer for the event, we have several positions available to fit your needs and availability. We will train you for any position you wish to help us with. It is very minimal and mostly self-explanatory, but we will be there to guide you so you can enjoy the event and feel confident in helping us. Also, as a member perk you get to come on our annual foray to help find fresh specimens, held Saturday Feb 16 location TBD. (Weather cooperating, otherwise we will suggest possible areas to scour for specimen). We will be discussing this a bit further in our January Monday meeting. Set Up 1: Saturday 2/16, 5-10 pm, food provided. We need to set up tables, chairs, booths, ID table, to be ready for next days event. Set Up 2: Sunday 2/17, 8-10am. Last minute touches making sure the room is ready to receive guests. Membership Table: Collect money and enroll new members (and old) for their membership. Children’s Table: Help facilitate activities for children during the fair. We have some games and ideas with this, but you are able to get creative and plan some of your own. Book Store: Need several!!! Sell merchandise from our book store (T-shirts, books and other interesting material). We accept money, Venmo, Paypal and CC. Floaters: Help all positions in the room. This helps people vending, greeting, and sales people are able to take adequate food and bathroom breaks. Will be able to help with all positions. Break Down: Severely needed help to break down everything after the fair! We need to make sure we remove all our items as well as the vendors, break down of tables and chairs. Looking for a volunteer opportunity that allows you to support a healthy river while interacting with a group of like-minded people? Come out with our core volunteer team to assist with River clean-ups! If you don't mind getting dirty and doing some trail blazing then this may be the perfect fit for you. This team is scheduled on Wednesdays from 9 - noon. The event location changes regularly so please include your email address in your RSVP and we will email you the Friday before with all of the details. You must be 18 years or older to participate and this event is not open for community service hour verification. All tools and supplies are provided. Hepatitis A vaccinations recommended for all participating volunteers. To learn more or RSVP please call 619-297-7380 or email volunteer@sandiegoriver.org. Join experienced San Diego Tracking Team members for a wildlife tracking walk. Learn the art of discovering signs left behind by resident creatures during two hours of âdirt time.â Suitable for the whole family. Donât forget to wear long pants, for kneeling down on your knees to get a closer look, and shoes suitable for trails. Meet in front of the Mission Trails Regional Park Visitor Center. Rain Cancels. Come enjoy the great outdoors and help the River Park Foundation to restore an oak woodland along a free-flowing mountain stream. Volunteers can help create habitat for wildlife and keep water clean by removing invasive plants, watering native plants, and more! This is a great opportunity to give back by getting your hands dirty, learn about local ecology and habitat restoration science, look for wildlife, and spend time in nature. This event takes place at Boulder Creek Preserve, near Descanso (about 1.5 hr drive from central San Diego). Please wear long pants, close-toed shoes (tennis shoes or hiking boots) and layers. Bring AT LEAST 32 oz. of water to drink and a snack. Please be aware that this is a remote location with no cell service. Also be aware that you may be working near poison oak. This event occurs on the 1st, 3rd, and 5th Saturday of every month from 8:30am to 2:30pm. All supplies will be provided. Community service hours may be verified. For full location information and to RSVP please contact volunteer@sandiegoriver.org or call (619) 297-7380. Directions: Take I-8 or Sea World Drive to their west end. Follow sign to Nimitz Blvd. Turn left on to W. Point Loma Blvd. Take your first right onto Greene St. Greene St. dead ends at the Garden. Park on the adjacent residential streets. Looking for a regular volunteer opportunity that allows you to experience the great outdoors while giving back? Then the River Assessment Team is for you! Every 2nd, 3rd and 4th Tuesday of the month the team will walk different segments of the San Diego River in the Mission Valley area to identify issues affecting our River, such as trash, storm water debris and illegal dumping. Your reconnaissance of these areas will allow us to effectively plan our cleanup events so that we are having a greater impact on the River’s health with the highest level of efficiency. The team will work from 9 am - noon in areas of varying levels of difficulty, ranging from paved trails to trail blazing adventures. You are invited to attend any and all, depending on your ability level. Closed-toed shoes are required. Sun protection, water and a snack are highly recommended. Must be 18 or over to participate.b NOT open for community service. If you are interested in getting more information about this event, please contact us at (619) 297-7380 or volunteer@sandiegoriver.org. Like taking pictures of flowers? Enjoy hiking or surfing? Like to read or play computer games? You can help science while enjoying these activities! Citizen Science is when members of the public contribute to real scientific efforts. San Diego is a scientific hub with many open, ongoing research efforts in need of people to contribute as volunteer researchers. You DON'T need a science background to help answer important research questions. Learn about the many citizen science projects happening here in San Diego and how you (and your kids) can contribute to real research. Community service hours can be verified. Come join the RiverWatch team in East County and learn how we monitor the water quality of the San Diego River! The Team uses a compact electronic sonde to collect real-time data on things like dissolved oxygen content, acidity, and the nutrient content of the water at 15 different locations along the River. This is the perfect opportunity for students who are interested in gaining experience in environmental science or community members who would like to learn more about local ecology. No experience necessary, the Team Leader will show volunteers how to use the sonde and nutrient test kits. Events are every 3rd Friday of the month. Community service may be verified, but only for students needing to complete school assigned hours. RSVP's are required for this event as there are a limited amount of spaces available. Due to the nature of the work, participants must be 15 years or older. For more information and to to RSVP please contact us at 619-297-7380 or volunteer@sandiegoriver.org. Groups and organizations with a common interest in the San Diego River have come together to form the San Diego River Coalition. The San Diego River Coalition also serves as the Citizens Advisory Committee (CAC) for River Park planning efforts. Directions: Take I-8 or Sea World Drive to their west end. Follow sign to Nimitz Blvd. Stay on Nimitz past West Point Loma Blvd. and take the Famosa/Catalina Blvd. exit. Turn right onto Famosa Blvd. (Famosa Blvd becomes Catalina Blvd.). Turn right at the traffic light onto Voltaire Street. Turn right onto Mendocino Blvd. The Reserve is located at Mendocino Blvd & Greene St, San Diego, CA 92107. Park on the adjacent residential streets. Come join the RiverWatch team in Mission Valley and learn how we monitor the water quality of the San Diego River! No experience necessary, the Team Leader will show volunteers how to use the sonde and nutrient test kits. Community service may be verified, but only for students needing to complete school assigned hours. RSVP's are required for this event as there are a limited amount of spaces available. Due to the nature of the work, participants must be at least 15 years old to attend. For more information and to to RSVP please contact us at 619-297-7380 or volunteer@sandiegoriver.org. Volunteer at the San Diego River Garden. Join us on the 2nd and 4th Sundays each month from 9am-11am for this family friendly event. All tools provided. Dress in clothes that can get a little dirty. Closed toe shoes required. Activities consist of weeding, watering, pruning, trail maintenance and other light gardening projects. RSVP's required. Call 619.297.7380 or email volunteer@sandiegoriver.org. Community service hours can be verified.